RainTyger Games presents Pirates of the Cursed Seas: Savage Shoresl! 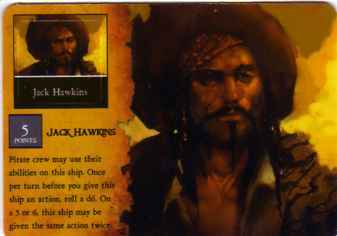 All Pirates of the Cursed Seas: Savage Shores individual cards for sale by RainTyger Games are mint, unpunched and unplayed unless otherwise noted. All cards are stored and shipped in sleeves. This piece includes one creature on two cards. Sea Monster. When you give this sea creature a shoot action, you can choose to make only one cannon roll. 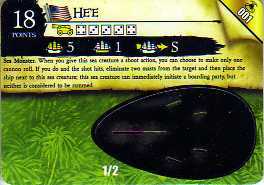 If you do and the shot hits, eliminate two masts from the target and then place the ship next to this sea creature; this sea creature can immediately initiate a boarding party, but neither is considered to be rammed. Revered by the natives as the fiercest predator in the sea, He’e can rapidly change the color of its skin to hide itself against any background.